Global Valuation & Consulting has all the experience and resources to complete Market Studies, Feasibility Analysis and Appraisal Reports for all types of Senior Housing appraisals including Independent Living (IL), Assisted Living (AL), Memory Care (MC) and Nursing Homes. The Senior Housing industry provides residential and personal care services for the elderly and other individuals who are unable to fully care for themselves or who desire to live in a community facility. The industry excludes companies that predominantly provide inpatient nursing, skilled-nursing or rehabilitative services. Demand for retirement and assisted living communities is on the rise, with an aging population and a growing need for Alzheimer’s and dementia care responsible for much of the industry’s growth. Alzheimer’s and dementia care are provided to individuals with memory impairment, which can include medical and social assistance with the activities of daily living, including bathing, eating and dressing. The percentage of the population aged 65 and older is growing, driving up demand for these services. The decision to move into a retirement community is influenced by an individual’s ability to pay for the services. Since many seniors finance the cost of living in industry facilities through their accumulated assets, industry demand is largely impacted by their wealth. Demographic trends have underscored growing demand for senior housing. As people age, they become more likely to suffer from chronic illnesses or lose some functional abilities. Retirement communities provide many options for these seniors to assist them with the activities of daily living. The average assisted living resident’s age is 87 years old, according to the Assisted Living Federation of America, an organization that serves the interests of senior living communities. The population aged 85 and older is expected to grow at about three times the national population growth rate due to advances in medical care that have increased the average life span. The more needs driven a housing segment is, the more insulated it becomes from recessionary forces. This factor helps explain why facilities that provide assistance with daily living are leading industry growth. Specifically, facilities that provide dementia services have outperformed independent living and continuing care retirement communities (CCRCs). CCRCs are age-restricted facilities that include a combination of independent living, assisted living and skilled-nursing services to residents all on one campus. Facilities for Alzheimer’s disease and dementia care, also known as memory care, are rarely stand-alone facilities; there is usually a wing dedicated to these services in assisted living communities. Medical awareness of dementia and identification of people at the earliest stages of the condition are rising, generating strong demand for facilities that include memory care. Many Americans have been delaying their retirement, which is expected to persist throughout the next two decades. Today, people have longer life spans and improved health, enabling them to extend their work lives. Additionally, people have decided to remain in the workforce for longer periods, as their savings accounts and pensions have suffered due to the recession. Major technological advances and new architectural designs will play a significant role in industry growth as demand for innovative amenities strengthens. To many consumers, retirement and assisted living communities are considered a refuge of last resort. To counter this perception, operators will adjust services and facilities to attract more knowledgeable and educated residents. More rooms will have instant voice and visual access to family and friends, while facilities will feature access to a wider variety of medical sources, ranging from physicians to nutritionists. Technology will be able to measure calorie intake and changes in weight, hearing, eyesight, blood pressure and vital signs. Also, operators will incorporate more home-like designs into their facilities that will likely include better and more creative use of light, sound, water and greenery to enhance socialization areas. Retirement and assisted living communities provide a substantial range of products, including independent living, assisted living, skilled nursing and a combination of these, usually referred to as continuing care retirement communities. Facilities that primarily provide skilled nursing are not included in this industry. The US Census Bureau classifies the segments as homes for the elderly and continuing care retirement communities. Assisted living communities are state-regulated rental properties that cater to seniors who need ongoing help with personal care and daily activities, yet also wish to retain their independence to the fullest extent that they can. Since these individuals do not need daily medical care at this point, assisted living can be an appropriate housing option. Assisted living facilities aim to provide as much autonomy as the resident is capable of. Most facilities offer 24-hour supervision and a variety of support services, with more privacy and space than many nursing homes, and usually at a lower cost. Assisted living services include assistance with simple domestic tasks, ranging from housekeeping, laundry and meal preparation to assistance with bathing and dressing. High-service assisted living facilities are more likely to provide services like transportation, assistance with medications, exercise and wellness programs, basic health status monitoring, help with locomotion, assistance with toilet use and nursing supervision or monitoring. Other services include temporary nursing care, minor foot care and, less commonly, hospice care and overnight sitter or companion services. Homes for the elderly, as defined by the US Census Bureau, include facilities that offer residential and personal care services; these companies do not offer onsite nursing care. Senior apartments, independent living communities and assisted living facilities are classified under homes for the elderly, where services may include room, board, supervision and assistance in daily living, such as housekeeping. Senior apartments are residencies that are legally restricted to seniors aged 55 and older who are not required to be licensed and often have income restrictions. They are similar in design to “family” complexes, except they usually have elevators, interior halls, more common area and only one and two bedroom plans. Senior apartments do not have central kitchen facilities and generally do not provide meals to residents, but may offer community rooms, social activities and other amenities. Independent living communities enable individuals to maintain their lifestyles without custodial or medical assistance. If custodial or medical care becomes necessary, residents are permitted to bring in outside services of their choice. Meals and activities are included as part of a monthly resident fee, but assistance with activities of daily living and health services (i.e. medications and nursing care) are not provided. Any housing arrangements designed exclusively for seniors may be classified as an independent living community and follow the US Department of Housing and Urban Development regulations, which allow for age discrimination. If the age restriction is 55 years and over, at least one person in the apartment must be at least 55 and the apartment community must have no more than 20.0% of all residents under the age of 55. If the restriction is 62 and over, then all residents must be at least 62. Continuing care retirement communities (CCRCs) are age-restricted properties that include a combination of independent living, assisted living and skilled-nursing services available to residents all on one campus. Resident payment plans vary and include entrance fee, condo/coop and rental programs. The majority of the units are not licensed skilled-nursing beds. There are two defining characteristics of a CCRC. First, it provides a continuum of care that includes housing, services and healthcare; however, it does not suggest that all three levels of care (i.e. independent living, assisted living and nursing care) are provided. Nursing care is always available, either on- or off-site, but assisted living is not always included. The second characteristic is a contractual agreement between the resident and the CCRC that guarantees these services or at least access to these services for a minimum of one year, but usually for the lifetime of the resident. CCRC contracts involve an equity agreement where the resident purchases a condominium or cooperative unit instead of paying an entrance fee. In a third, but less common, type of CCRC contract, residents pay monthly fees only. Different from assisted living facilities, independent living facilities and CCRCs are more affected by changes in the housing market and economy. People entering independent living communities choose to do so for lifestyle reasons, not because they have a healthcare need. Many CCRCs are entrance-fee facilities that require potential residents to pay a certain amount upfront on top of the monthly fee. Although a portion of this fee is refundable, most people use the money from selling their home to pay the entrance fee. The Primary Market Area (PMA) demand for Senior Housing is derived from age 55+ within a 15-mile radius around the subject site. The Secondary Market Area (SMA) is usually a 25-mile radius, however in the southern states demand is also generated from the northern states and Canada. 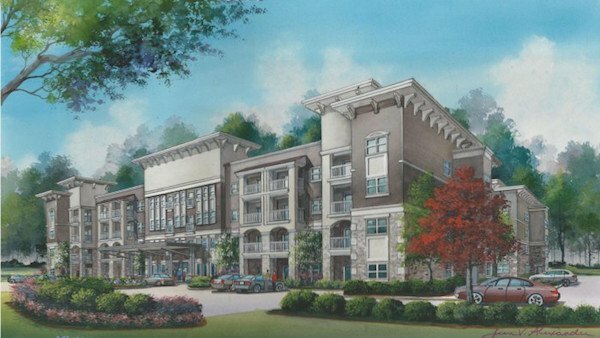 Luxury Hi-Rise Rental Apartment Complex – A diversified mix of 242-units including Independent Living (IL), Assisted Living (AL) and Memory Care (MC). Amenities included ocean views, dining rooms, library, fitness facilities, card rooms, lobby, reception and parking.